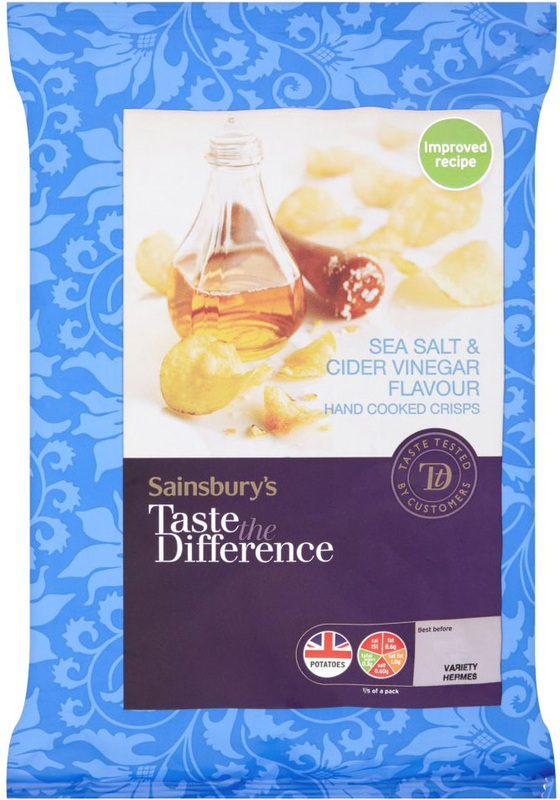 The bag design of the Sainsbury's Taste The Difference range is very neat and tidy. The bags are flavour colour coded, with a nice floral pattern in the background. The main image is a two part label. The purple taste The Difference section is spread across the whole range of foods, which leaves the top section to display the alleged ingredients. This evokes the flavour well, but overall the impression is somewhat plain, except for the surrounding colourful image, which is quite striking. These were thickly cut, oil hardened Crisps, that deteriorated from crispy, crackling crunch right through the stages to mushiness at exactly the right pace. There were no brittle sharp edges and there was no soft melting. Although Hand Cooked (Kettle Cooked in regular Crisps parlance), they looked like thickly cut Crisps. There were not the usual bends and curls you would ordinarily associate with Crisps of this type. There were however a few oil blisters and an uneven surface. The colour was a relatively bright yellow and there was not much seasoning visible. A Nose Plunge Test revealed an aroma that you would usually identify with Fish & Chips. The mixture of oil, paper bag, salt, vinegar, potato and fish combines so well that it has encouraged people from around the World to eat the traditional British dish. That is unlikely to be replicated by these Sainsbury's Crisps. There was a slight hint of Salt, the Vinegar was not of the Malt variety, which led to a sweet Vinegary blend with oil and the afore-mentioned Salt. There was an even balance of flavours, but it was not as pleasant as the alluring aroma.